What comes to your mind when someone mentioned Hyundai? I don't know about you, but I tend to associate it with Korean cars such as Elantra, Sonata and Santa Fe because these are Hyundai cars that ply on our roads everyday. Their cars have come a long way in terms of design and sportiness since the arrival of a former BMW designer at Hyundai, along with the arrival of a former Audi designer at their sister company, Kia. Apparently Hyundai is not just about cars - they did not joke when they said they wanted to fight global warming by reducing carbon footprint. The Korean giant car maker, had last month installed the country’s largest rooftop PV installation! 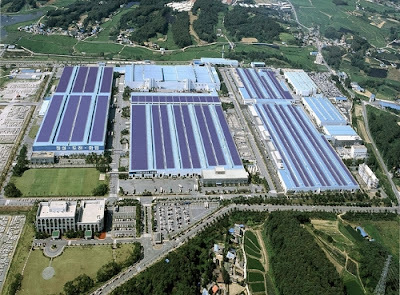 South Korea's largest rooftop PV installation: 40,000 panels producing 11.5 million kWh of electricity per year from solar has been installed on top of Hyundai manufacturing plant in Asan City of South Korea. The South Korea's largest car maker, has this week installed the country’s largest rooftop PV installation atop its production plant in Asan, a city some 95 kilometers south of the capital, Seoul. Spread across 213,000m² and covering 68% of the ceiling space, the installation will be capable of producing enough clean PV energy to power 3,200 local households annually, delivering enough clean electricity to mitigate 5,600 tons of carbon emissions a year. Korea Electric Power Corp. has agreed to purchase the electricity generated to distribute in the local Asan area. The panels provide an additional benefit for plant workers, too, as they help reduce temperatures inside the plant during summer, reducing reliance on air conditioning and helping to improve efficiency and working conditions. TheGreenMechanics: What a way to make cars! Japanese bra only unhooks for true love? What is black box recorder made of? What is your Household Electricity Use? Blog and web listing + link exchange, go to BLOG ROLL. Green, renewable, sustainable - they all sound great and important, but efficiently managed energy sources will help preserve mother earth just as good. For me, I suppose I'll contribute towards that goal by sharing my experience and opinion. The Green Mechanics ©2009 - 2017. Powered by Blogger.